Muslim Brotherhood, Mainstream In Many Countries, May Be Listed As Terrorist Group : Parallels The Trump administration is considering listing the Muslim Brotherhood as a terrorist organization. It's banned in some countries but considered a mainstream political group elsewhere in the Mideast. 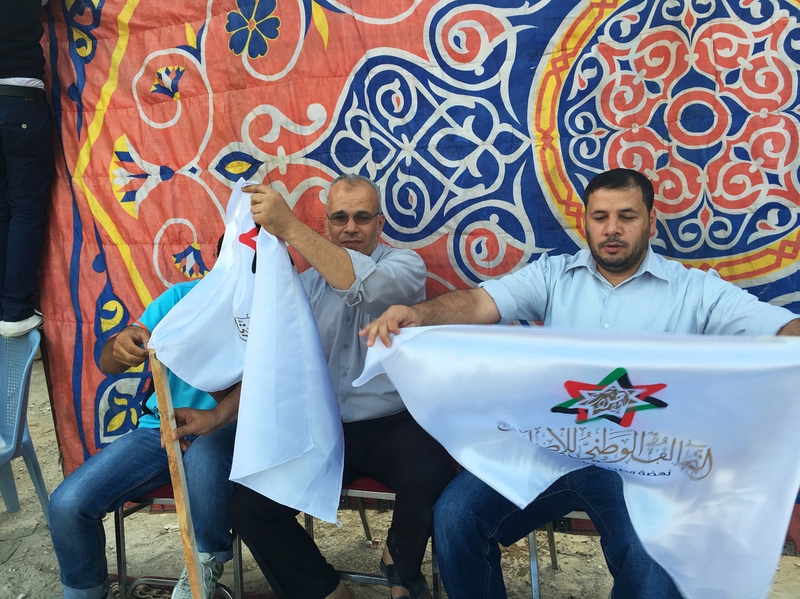 Muslim Brotherhood campaign volunteers work at an election rally in Zarqa, Jordan, in September 2016. The brotherhood's political wing fielded candidates under a coalition that included Christians and ethnic minorities. The group is now the biggest bloc in the Jordanian Parliament. It's a chilly midmorning in a clinic in the working-class neighborhood of Sweileh in Amman, Jordan. Children wearing winter coats donated by charity organizations sit on plastic chairs, waiting to see doctors and dentists. Pamphlets in the clinic, published by the Muslim Brotherhood, offer advice on being a good Muslim and instruction on how to pray. But it's not really religion that brings people here. "They come here mainly because they only pay a symbolic amount for treatment ... and all the medication is free," says clinic supervisor Aisha Radwan. 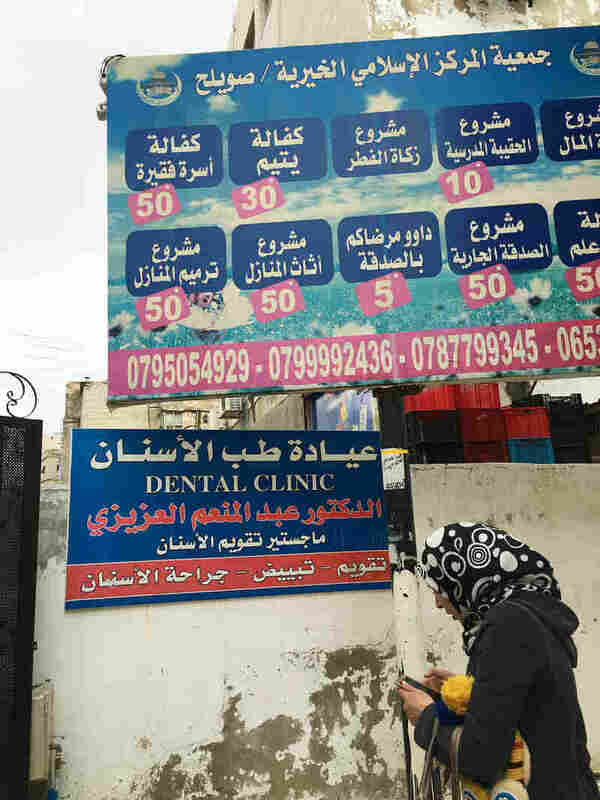 Outside an Amman charity founded by the Muslim Brotherhood and now run by the Jordanian government, a sign lists medical services and benefits given to poor families. The brotherhood has built a large support base in Jordan by filling in gaps in government services. The patients are mostly refugees and Jordanian orphans. The clinic is one of dozens in a charity network founded by the Muslim Brotherhood and now run by the Jordanian government. The clinic even received support from the U.S. Agency for International Development, which funded its renovation three years ago. In the U.S., the Trump administration is considering designating the Muslim Brotherhood a terrorist organization — a move that would be welcomed by Egypt, which has had a complicated history with the organization, and several other countries. Saudi Arabia, the United Arab Emirates and Syria also consider the group a terrorist organization, accusing it of trying to topple existing governments. But in Jordan, one of the strongest American allies in the region, the Muslim Brotherhood's charitable activities have made it part of the fabric of mainstream society. The organization's political wing is the biggest bloc in the Jordanian Parliament. The movement also has members of Parliament in another U.S. ally, Tunisia, and in Bahrain, where the U.S. maintains military bases. "The brotherhood is everywhere in the world where there are Muslims," says Murad Adeleih, spokesman for the Islamic Action Front, the organization's Amman-based political wing. He says the Muslim Brotherhood is a peaceful civil society organization operating in 92 countries. It officially renounced violence decades ago. Leaders say there are few operational links between its organizations in different countries, but the central tenet they share is promoting Islamic thought and ideals. Adeleih and many analysts say designating the Muslim Brotherhood a terrorist organization would encourage extremism by sending the message that the U.S. does not differentiate between different Muslim groups. "Frankly, this is a dangerous [proposal] because it constitutes a war on Islam," Adeleih says in his office in downtown Amman. "In a lot of countries, we are in partnership with governments and parliament. It would be very difficult to implement." The Muslim Brotherhood was born in Egypt as a nationalist movement under British occupation in the 1920s. In recent decades, it gained popularity by offering the prospect of a religiously based alternative to corrupt, autocratic governments. 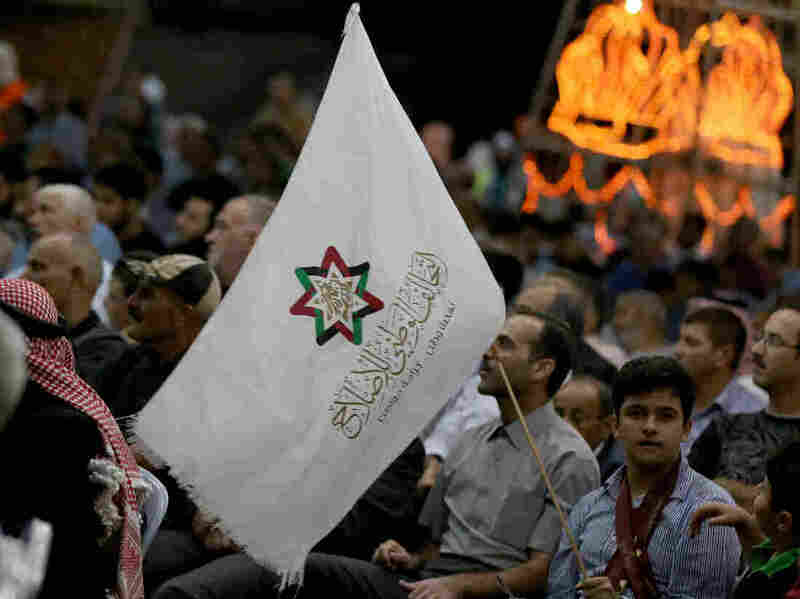 Supporters attend a gathering for Jordan's National Alliance for Reform, a political bloc including the Muslim Brotherhood, in Amman's Sweileh District last September. "In a lot of countries, we are in partnership with governments and parliament," says a brotherhood spokesman in Amman. A year after the fall of Egypt's longtime president, Hosni Mubarak, Egyptian voters elected a Muslim Brotherhood president. He was toppled in a 2013 military coup that brought current president, Abdel-Fattah el-Sissi, to power, after which the organization was outlawed. Egypt has since hunted down and killed Muslim Brotherhood leaders and jailed thousands of its members. Jordan's Muslim Brotherhood officially broke ties with the Egyptian organization after the 2013 military coup. Many Egyptians believe the Muslim Brotherhood was incapable of governing in Egypt and squandered its chance at power. That defeat has shaped a more conciliatory Muslim Brotherhood in countries such as Jordan, which has defused the movement's power by splitting it and encouraging a pro-government faction. "The brotherhood is a seasoned movement that understands the dynamics of politics and the need to be able to lead a constructive dialogue. That is how they have evolved and developed," says Jordanian political scientist Labib Kamhawi. Kamhawi says designating the Muslim Brotherhood as a terrorist group would create serious problems for Jordan's King Abdullah, a key partner in the fight against ISIS, and for Jordan itself. "It would be very difficult to defend such policies or accept it. Jordan would be forced to take a stand that would not condone such policies," he says. "You cannot assume that the U.S. is a friendly nation if this friendly nation is launching a vicious campaign against Muslims." A major British government report concluded that although offshoots of the Muslim Brotherhood have engaged in violence, it should not be classified as a terrorist organization. Over decades, the Muslim Brotherhood has put down deep roots in Jordan through its network of charitable organizations. Those organizations are now controlled by the Jordanian government, but the group still commands considerable influence. Down the hall from the clinic in Sweileh, director Mohsen Ramawi meets with caseworkers to go over the detailed files of new families, orphans and needy students applying for aid. The money comes from donations — many from people who believe the Muslim Brotherhood is more efficient and less corrupt than the government. A widow named Azaya comes in to collect a monthly payment of about $50. She works full time in a clothing store but doesn't make enough to support her three daughters. "We treat people as Islam asks us to treat people, especially the poor," says Ramawi. Caseworker Maha Gharbouti presents Ramawi the file of a new applicant — a Jordanian family with an undernourished child. Gharbouti studied pharmacy, but at the charity, her main job is supporting widows. Her warm brown eyes are the only things visible behind the all-enveloping black niqab she wears. "The women can tell me their problems and their feelings," she says. "These [are] the things the government can't help with." A previous Web version of this story incorrectly stated that Egyptians elected a Muslim Brotherhood president six years after the fall of Hosni Mubarak. The election took place in 2012, a year after Mubarak's fall. The audio version of the story incorrectly states that the 2012 election took place six years ago; it has been five years.